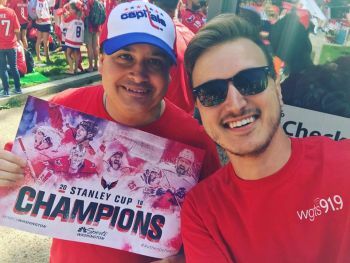 WGTS/Wash DC’s Spencer White (morning show producer) and Tom Miner (afternoon show producer) gave live updates on the air from the Washington Capitals’ celebration parade in downtown D.C. Tuesday. “This is a dream come true! First time in the franchise history that the Caps have won! Now it’s time for the Nats & Redskins!” -Spencer White.